First things first. 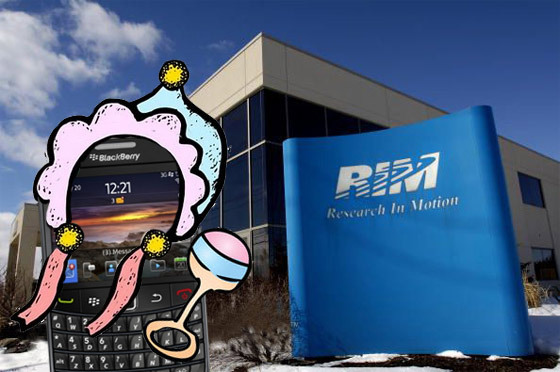 "Reset your BlackBerry" is a bit of an ambiguous term; it can have quite a few different meanings. It all really depends on what you want to do with your BlackBerry. Resetting your BlackBerry can be as simple as performing a soft reset or a battery pull. Both will restart your smartphone, hopefully fixing whatever issue you're experiencing. A much more invasive type of reset is a the complete wipe of your phone's data and operating system, using a third-party program on your computer. There's also the option of the Security Wipe. Beware with the security wipe, you could end up losing all of the data on your phone and memory cards. Somewhere in between a battery pull and a security wipe is the option to complete a Factory Reset. 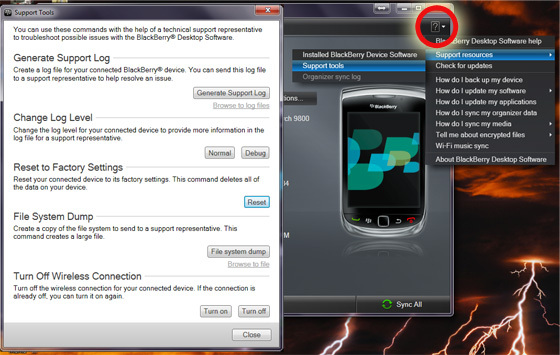 Using BlackBerry Desktop Software (or some command line...er, commands), you can reset all of the settings on your device to their "factory" defaults. And no, this option doesn't return your BlackBerry to the way it was when it left the manufacturer. I checked. After the factory reset, I was still running the same version of the operating system as before and not the one the device shipped with. Like the security wipe, this type of reset will also remove any lingering IT policies from the days when your BlackBerry might have been connected to a BES. Unlike the security wipe, it leaves all of your applications still installed. All of the settings and such for the applications will be wiped out, but at least they don't have to be reinstalled. Warning! Bad things can happen! Even though the reset leaves your applications intact, the Factory Reset is still a fairly invasive wipe of your smartphone. When it is done, all of your application data; saved WiFi networks; word substitutions; emails; and much, much more will be gone. Irrecoverably gone. As in, it's not coming back. It won't be hasta la vista, baby. It will be hasta nunca más. Once the reset is started, that data is not coming back would be the main bullet point of what I'm saying here. So please, for the love of all that is good, back up your data. There are a couple of different ways to start the reset (after you've backed up your BlackBerry, of course). One is by using a command line interface and typing your commands. I grew up using MS-DOS 4.0, so I'm no stranger to typing in commands. BlackBerry Desktop Software makes things a bit easier, though. In the top right corner of the application running on your computer, you'll see the "Help" question mark. Click on it, then click Support Resources, and finally click Support Tools. Again, that's Help -> Support Resources -> Support Tools. There are a number of these tools in this window, but we're only interested in one of them: The Factory Reset. After you've completed a backup, click that button to continue. There are several reasons to perform a Factory Reset: for me, I needed to clear up some permissions problems. I'm pretty sure that I monkeyed around a little too much in my application permissions settings (specifically the default permissions) and caused some things to go all wonky. ("Wonky" is a perfectly acceptable technical term... or at least it should be. I mean if two shakes of a lamb's tail can be a term of scientific measurement used in nuclear physics [2x10 nanoseconds], I can use the word "Wonky"). If application permissions are the reason for my needing a Factory Reset, it would be pretty foolish of me to restore them to the phone when I'm done with the process. So you might not want to do a complete restore of the phone's data that you backed up. 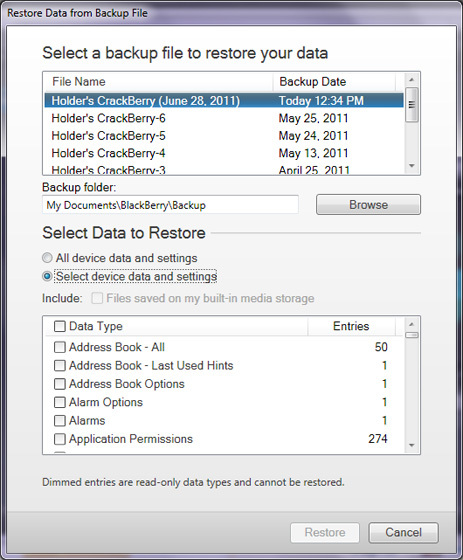 In BlackBerry Desktop Software, you have the option to select what data will be restored. Start a Restore process as normal: from the Device menu, select Restore. In the middle of the window that opens, you'll see the "Select Data to Restore" section. If you click on the radio button next to "Select device data and settings" you'll be able to select what databases and options you'll restore to your phone. The Factory reset is not for the faint of heart or the ill-informed. Not only is the vast majority of data on your BlackBerry destroyed, but the process usually requires a selective restore (or no restoration of data at all) to truly solve whatever problem you're experiencing. Still, there is a first time for everything. 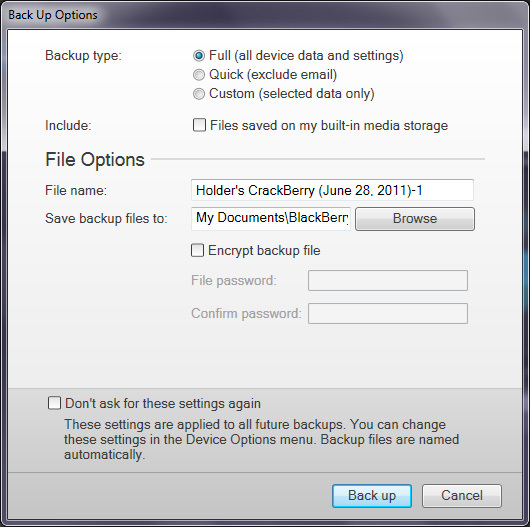 If you are careful in backing up the data on your BlackBerry and feel comfortable mucking about in the operating system of your smartphone, you should be fine. The Factory Reset can't solve all problems and indeed may be more (or less) of a "reset" than most people need. Like many things BlackBerry, the option is there; but the choice to use it is up to you.